Reserve space for seminars, satellite or videoconference equipment, meetings, weddings, holiday parties, trade shows, forums, company parties, and company picnics. Contact the Visitor Experience Manager at 417-862-9910 ext. 709 for more information. Question: When can I have an event at Discovery Center? 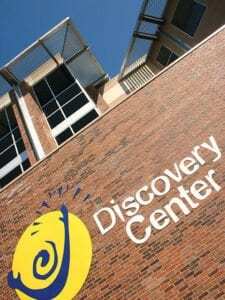 Answer: Discovery Center is open for rental 7 days a week during the day and late evening hours. Discovery Center is open to the public Tuesday through Thursday 9:00 am to 5:00 pm, Friday through Saturday 9:00 a.m. to 6:00 p.m., and Sunday 1:00 p.m. to 5:00 p.m. and occasional Mondays. Only Discovery Center’s non-exhibit areas are available for private rental during operating hours. When renting after hours, all guests, contracted services, and decorations must be cleaned up and off the premises by 1:00 am or the Renter agrees to pay a $100.00/hour overtime charge starting at 1:01 am. Q: When can I reserve a date for my event? A: Reservations must be made at least 2 weeks in advance. A 20% non-refundable reservation deposit is needed to hold the date. This deposit can be applied toward the rental fee, but cannot be refunded if the event is cancelled. Q: What happens if I need to change or cancel my event date after it is reserved? A: The client must speak to Discovery Center Staff that coordinates rentals to cancel the event. Depending on the availability of space, the Discovery Center will work with you if a date change is needed. Q: Will Discovery Center provide staff for my event? A: Discovery Center staff is available only for general assistance, exhibit facilitation, and emergencies. This does not include set-up or take-down, cleaning, or serving. There is additional cost for staff depending on your event. Q: Is Discovery Center involved in the planning of my event? A: Discovery Center will provide advice and suggestions on the planning of your event. Discovery Center must approve all event plans. Q: Can my guests play with the exhibits? A: Yes, depending on the space that you are renting certain exhibits will be available. A: Your guests may park on the East side of the Discovery Center; our parking lot holds 79 cars. There are also many free parking spaces surrounding Discovery Center’s building. Q: Does Discovery Center provide tables, chairs, serviceware, and linens? A: A limited number of tables and chairs can be provided for your event. There is a fee for additional tables, chairs. Black linens are available through Discovery Center for a rental fee of $8 each. Discovery Center can provide suggestions of vendors where you can rent additional items. Q: Does Discovery Center provide food and servers? A: Discovery Center does not provide food or servers. Discovery Center can supply the names of area licensed caterers or you can supply your own food. A: You may only serve alcohol at your event during Discovery Center’s non-business hours and you must hire a licensed caterer with a liquor license if you choose to have a cash bar. Discovery Center can provide you with suggestions of caterers. Alcohol cannot be served past 12:00 a.m. and cannot be taken off the premises. Additionally, the renter will be required to provide a Certificate of Insurance for Liability, with Host Liquor Liability, that names DCS insured also. Q: Can I decorate for my event? A: You can bring decorations for your event; however, there are some restrictions. Discovery Center will provide you with information on allowable decorations. Q: When can I set up for my event? A: If you are renting non-exhibit areas, you may set up during normal Discovery Center business hours. If you are using exhibit areas, you may set up as soon as Discovery Center closes. You can contact our team at 417-862-9910 for a contract and to set up a visit to the Center or email us by clicking the button above. View parking and driving directions here.